Power systems engineer Michael Starke is working on more efficient, resilient, and cybersecure microgrid technologies with novel communication and control systems. Photo by Carlos Jones, ORNL. When Michael Starke leaves the lab each day, he continues his work, in a sense, at home. The power systems engineer is developing methods to precisely control building electrical loads—and in his off hours, he has automated his own home with upwards of 90 smart devices to manage everything from heating and cooling to lights, appliances, and even his garage doors. “Most people who enjoy what they do at work continue it in some form at home,” says the engineer in the Electrical and Electronics Systems Research Division at Oak Ridge National Laboratory. Starke’s research focuses on power grid resilience—technology that hardens the grid against outages and improves response when disruptions do occur, whether by damaging storms or even cyberintrusion. The grid is made up of central facilities that generate electricity, transmission lines that carry power across long distances, and distribution lines that connect individual consumers. But in recent years, electricity increasingly is being generated where it is consumed, largely enabled by renewable resources like solar and wind power—known as distributed energy resources. When these resources include an energy storage component, the system is known as a microgrid. Starke is working with other scientists and engineers at the lab to demonstrate some of the ways these distributed resources can result in more precise control of electrical loads, provide reliable electricity to communities, and even improve the function of the larger power grid. The work revolves around transactive controls, which take into account everything from a customer’s electricity usage and weather patterns to utility rates when managing heating, ventilation, and air conditioning (HVAC) systems; smart appliances; and microgrid resources for the most efficient use of energy at the lowest cost to the homeowner. The system can automatically gauge when it’s best for a building to use the energy it produces, store it, or sell it to the utility. Starke’s task is overseeing the development of software components to communicate with and optimize microgrid resources and building energy loads. The algorithms being developed are open-source and designed to work with equipment from any vendor. The system is being demonstrated in a program called Smart Neighborhood, in which utility partner Southern Company is equipping new residential communities in Alabama and Georgia with microgrids and smart home appliances controlled by national lab–developed technology. In another grid-related project, Starke and his fellow engineers are devising controls for an energy storage system made up of used electric vehicle (EV) batteries. Batteries that can no longer adequately serve an EV often have plenty of life to serve as energy storage devices, he notes. The secondary vehicle battery energy storage system is planned for deployment later this year as a 16–18 kWh system in a Habitat for Humanity community in North Carolina. The software to control the system is also being developed as open source—designed for compatibility with equipment from any source, Starke noted. It will control the system’s inverter, which converts power from the DC produced by microgrids to AC for household use, while regulating voltage and frequency. Starke would like to implement the kind of predictive control his research enables in his own home someday. For instance, Starke says his house was built with an underrated HVAC system that has a hard time keeping up with cooling demand during hot Tennessee summers. With a predictive control system, his home could precool itself when high temperatures are expected. For Starke, becoming an electrical engineer (EE) is a family tradition. Starke’s father is also an EE, as are several uncles. His parents emigrated from Germany to East Tennessee in the 1970s so his father could take a position as an EE at the Alcoa aluminum facility, now known as Arconic. Starke even met his wife through EE classmates while attending the University of Tennessee, Knoxville, where he earned both his master’s and doctoral degrees in the subject. 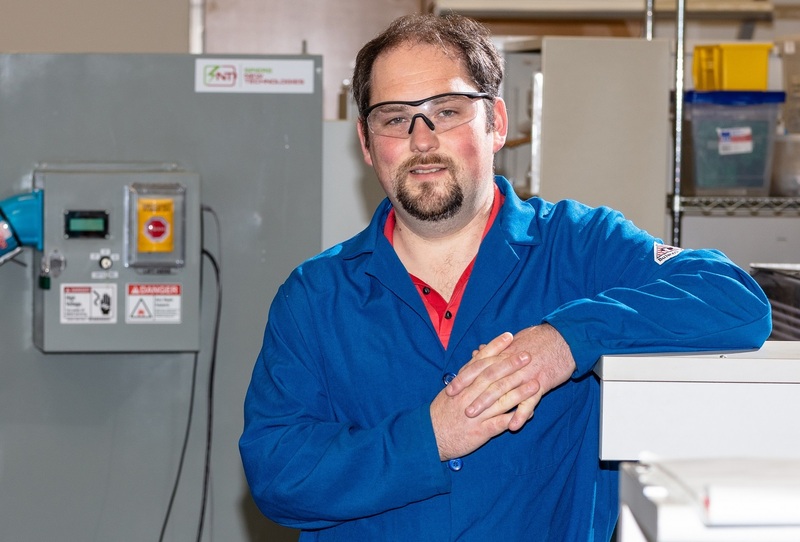 The researcher first came to ORNL as a post-master’s student, working at the Power Electronics and Electric Machinery Laboratory at the National Transportation Research Center. Starke’s master’s thesis was on thermoelectric devices, researching better ways to cool advanced power electronics. He switched to a focus on power systems engineering for his PhD and today works in the Power and Energy Systems Group at ORNL. In addition to the transactive controls and secondary-use energy storage research, he led a team developing a tool to evaluate the potential of industrial customer power loads for demand response and another team that devised an open-source microgrid controller. One project Starke is engaged in that holds great promise is lab-directed research on large-scale optimization and control of building loads. Starke is working with ORNL colleagues to develop tools and simulations for extremely large models of these systems using the lab’s supercomputing resources. “We want to understand the repercussions of controls and optimization and how we can create the central intelligence that will let these resources make their own decisions,” he said. ORNL is managed by UT-Battelle for the Department of Energy's Office of Science, the single largest supporter of basic research in the physical sciences in the United States. DOE’s Office of Science is working to address some of the most pressing challenges of our time. For more information, please visit http://science.energy.gov.